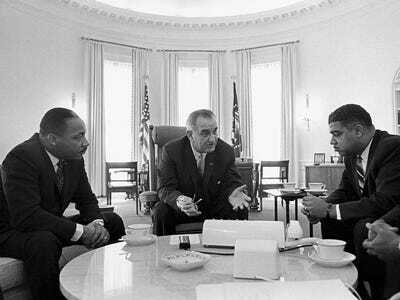 President Lyndon Johnson meets with Civil Rights Leaders including Martin Luther King Jr. in 1963. WASHINGTON — The Voting Rights Act that goes on trial at the Supreme Court on Wednesday has helped boost African Americans’ presence in Southern legislatures. But in a twist of irony, it also has contributed to their loss of political clout.Since its passage in 1965, the law’s Section 5 has forced states with a history of racial discrimination to clear changes in voting procedures with the federal government. The Justice Department, in turn, has insisted that drawing district lines is one of those procedures – one that should give blacks and other minorities ample opportunity to elect their preferred candidates. MORE:(AT) Voting Rights Act: Do we still need it? That has led to the creation of so-called majority-minority election districts dominated by blacks or Hispanics, nearly all of them Democrats. Achieving that goal, however, has required the simultaneous creation of more heavily white, Republican districts in surrounding areas. Although the Voting Rights Act has played a major role in the South’s racial transformation, it also has played a supporting role in its political transformation. In 1965, every state legislature was Democratic. In 2013, they are all Republican. “African Americans are totally and completely shut out of any political influence, with a few exceptions, in the Southern states,” says David Bositis, senior research associate at the Joint centre for Political and Economic Studies. The court’s decision, expected in the spring, could have an equally ironic result. If the justices keep Section 5 intact, it will help maintain or boost blacks’ and Hispanics’ ability to win elections. But it won’t help their party at the polls. In 1965, the 11 states of the Old Confederacy, stretching from Virginia to Texas, had a total of three black state legislators. By 2009, the number had grown to 321, or 18 per cent of the total, according to the National Conference of State Legislatures. But over the same period, Southern legislatures that were overwhelmingly Democratic in 1965 have switched to Republican dominance. The last ones flipped over to the GOP since 2010 in Alabama, Arkansas, Louisiana, Mississippi, North Carolina and Virginia. Today, the GOP controls both houses of the legislatures in all 11 states. Even the Virginia Senate, tied 20-20, is ruled by Republicans because of a GOP lieutenant governor. And only three of the 321 black state legislators are Republicans. Most of the others come from majority-minority districts – but politically, they’re back in the minority. The Voting Rights Act’s focus on creating opportunities for blacks to win election is just one factor. The South had been trending toward the Republican Party ever since the civil rights era, and in part because of it. The trend, which included Democratic office-holders switching to the GOP, increased during Ronald Reagan’s presidency. The phenomenon calls attention to one of the lingering problems in the South that the Voting Rights Act hasn’t cured: racially polarised voting. For blacks to win election, they often require districts that are majority-black. The same goes for Hispanics in the Southwest. That dilutes their clout in neighbouring districts, making it easier for Republicans to capture those seats. At the same time, state legislatures that have sought to design “safe” Republican or Democratic districts for political advantage tend to draw them homogeneously, says Haley Barbour, a former Mississippi governor and Republican National Committee chairman. “You have certainly had times where black Democrats and white Republicans had their interests served by the same redistricting,” Barbour says. The latest effort to combine the two goals came in Virginia earlier this month. Senate Republicans sought to create a sixth majority-black district in the 40-seat Senate while increasing the GOP’s margin in eight other districts. The effort, which could have solidified Republican control of the 20-20 Senate, was blocked, ironically, by the Republican House speaker. But in North Carolina, lawmakers have boosted black majorities in many legislative districts to greater percentages than are needed to elect black legislators, ”effectively bleaching the rest of the state,” says Paul Smith, a civil liberties and human rights attorney. “There is a willful interpretation of the Voting Rights Act that is justifying the re-segregation of North Carolina,” Smith says.